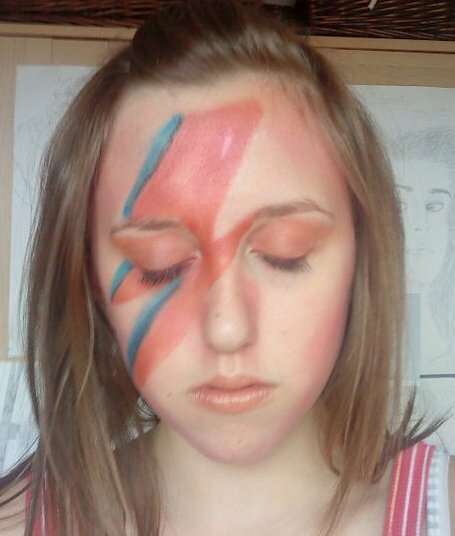 Yesterday I went to school dressed as David Bowie.. I got up at 5:30 am and I ready by 7:30. I went to get on the Metro Transit ... at first I was a bit iffy on it.. but I got on. I laughed with a friend I go to school with. As the drive went people stared and watched as they came on the bus. I laughed. Other random stuff happened. I never won the costume contest. She picked the best dressed. She picked some indian costume. I took the paint off at 10 pm last night .... ouch. I put cream on and went to bed. 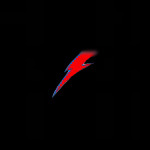 I woke up this morning with a lightening bolt red burn on my skin. And I still have it. Apparently its called glue sniffers rash ... hilarious I know. You both are so freaking cool. I think if I tried, I'd kill it. Haha. HAHA! xD you guys are awesome! Goooood times! Everyone should do it! These are great. 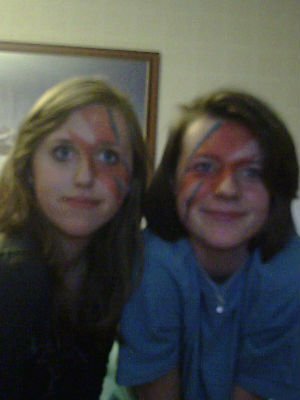 It's always good dressing up as Bowie! MoonageDaydream, you'r my "Heroine" of the day. Kudos!